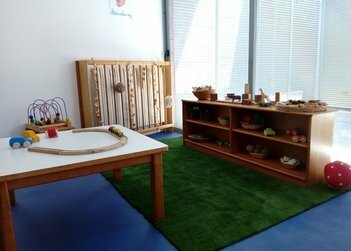 The Formentera Council's education and culture offices wish to announce that from Monday, September 18, the island's two early-childhood education centres, or escoletes, are back in session. The two schools, sa Miranda and Camí Vell, had closed their doors on September 1 for upgrades. It is back-to-school season for the families of 106 girls and boys on the island; seventy-nine children attend classes at sa Miranda and 27 go to Camí Vell, in 9 classrooms (7 in sa Miranda; 2 in Camí Vell). Esperança Sunyer is the schools' director. She is joined in her work by 18 educators, two kitchen personnel and two cleaning workers. In all, very child aged two to three who requested a spot received one. There are three newborns and six 1- to 2-year-olds on the waiting list. In the first half of September, crews carried out €56,000 in upgrades at the two escoletes. Sa Miranda had humidity problems, grounds were refitted and new drywall installed in four rooms, improvements were made on one walkway and an access ramp was put in for deliveries. At l'Escoleta del Camí Vell, various upgrades were carried out. Humidity spots were removed from two classrooms and new turf was put in the courtyard. The work team comprised the education and culture departments' staff specialists, teachers and the CiF maintenance and work crews. The Formentera Council reported today on maintenance operations this summer at the island's three public primary schools. Education secretary Susana Labrador said upkeep at Sant Francesc's Mestre Lluís Andreu and the schools of Sant Ferran and el Pilar de la Mola, requested by school administrations, local parents' groups and student councils, was intended to get educational centres primed for the return of pupils tomorrow, 13 September. In Mestre Lluís Andreu's lower building, the Council's maintenance brigade prepped an existing courtyard structure for storage use, cleaned the courtyard and boiler room, repaired damaged shutters and window tracks, scraped and painted inner doors and performed checks of electrical fixtures. An outside firm was brought in by the Council to repair leaks and paint the hallway and entrance of the early-learning centre. The work cost €12,251, VAT included. Council crews also carried out regular maintenance and fixed a leaky boiler in Mestre Lluís Andreu's upper building. 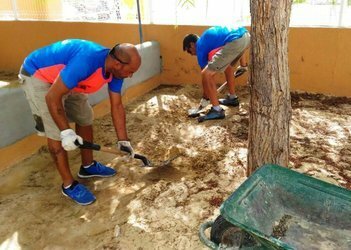 In Sant Ferran, the maintenance brigade painted classrooms, doors, railings and window bars, mounted a wooden shed in the courtyard of the toddlers' school, built new furniture and conducted regular upkeep. Outside companies were tasked with filling cracks in the roofing over classrooms and building numerous structures: a partition to create a natural light area in one room, accessible wheelchair ramps on multiple outdoor walkways and walls around the sides of the school's sandbox, to keep mess to a minimum and improve conditions for play. Other upgrades included new, earth-friendly artificial turf in the toddlers' swing area and cost €9,998.90, VAT included. Painters were brought in to clean and paint the deteriorated outside walls of the building's central area for €9,005.52. 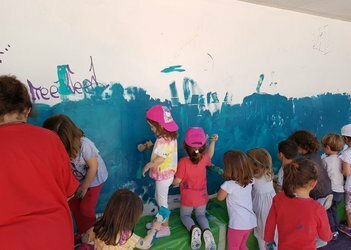 In la Mola, crews spruced up paint jobs on the school's inside and outside walls, performed checks of air-conditioning units and electrical fixtures and did other regular maintenance. The education secretary asserted that it is the Council's job to see to upkeep in schools and, for that reason, two individuals on the administration's work crew are tasked specifically with overseeing year-round regular maintenance. 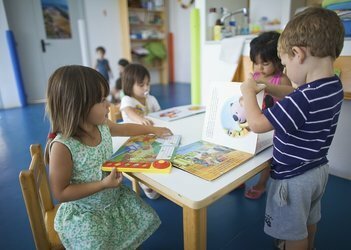 According to the Formentera Council's education office, the island's two nurseries, or escoletes, have the resources available to give 125 children early-childhood care. Together, the pair, Sa Miranda and the Escoleta del Camí Vell (“the nursery on the old road” to la Mola), have announced their potential to take in 52 new pupils this autumn. The task of caring for the children falls to 16 instructors at the two schools, a sign, chief of education Susana Labrador said, “of the Council's serious commitment to Formentera families”. In 2017-2018, Sa Miranda will comprise seven groups—one for newborns (children born in 2017), three for one- and two-year-olds (infants, born in 2016) and three for two- and three-year-olds (toddlers, born in 2015). Eleven educators will be responsible for the school's 98 pupils and at least one aide will oversee children with special needs. At Camí Vell there will be two groups, infants and toddlers, and overall capacity for 30. Next year, with three spaces in the toddlers' group left unfilled, the school expects to have a total of 27 pupils. Three people steer instruction at Camí Vell. The two schools follow similar approaches and staff from the centres meet weekly to coordinate instruction. They also share a kitchen, and a cook and kitchen assistant in charge of daily meals. In a nod to the gold-medal honour awarded to the island's community of medical care providers, the Formentera Council's language advisory service has teamed up with the chamber of commerce and the Pityusic small and medium-sized business group on a new outreach push. The initiative entailed design and printing of a number of posters unpacking various health-related terms. As in years past, the posters will be handed out at local shops and offices of the Council and will spotlight peculiarities and the etymology of words like guarir, salut, morbo, malaltia and infermer/a. 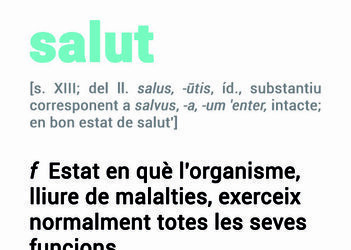 As CiF education and culture secretary Susana Labrador explained, “the initiative seeks to highlight an important selection of words used in medical care,” something she asserted was “particularly significant given the key role such care has played for the people of Formentera”. The posters explore twelve concepts and can be requested at the Citizen's Information Office (OAC). The Formentera Council's Offices of Youth Services and Education have thrown their support behind Educart, a project of Marc Ferrer secondary school to educate with art. A year in the making, Educart takes place every day this week between 11.00am and 1.30pm at Es Molí social centre located at 88, avinguda Porto-Salè. The goal of Educart, besides bringing art to Formentera youth, is to put them in the creative driver's seat. Participants hail from all of the island's schools and from every level of schooling, from nursery through secondary. The student-teacher initiative will culminate in an art show at Es Molí.